Custom NPC Addon allows you to create your unique characters that can be used for almost anything. For example, when you create a map, you may need a character to the story, and this addon can do it. You can change two characteristics of the character's name and skin. How to create an NPC? Select villager spawn egg and throw it where you want to see the NPC. You can spawn an infinite number of characters, but be careful - you can not cancel the action. Therefore, after the spawn you can not remove the NPC. You may have lag with a large number of characters. How to give a name? 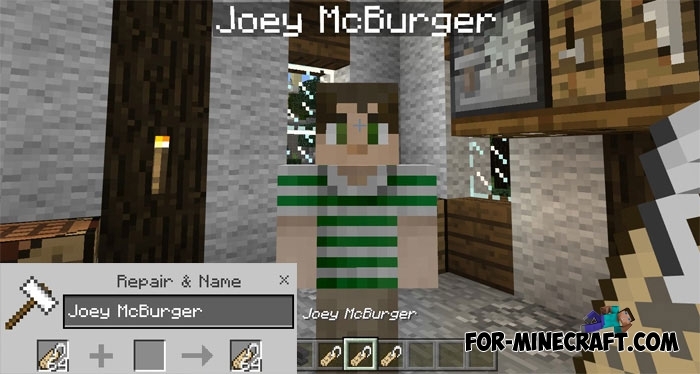 Use name tags to give the name of any character. Names can be any that is very useful in the development of maps. So you will be able to diversify the story with new characters. How to change NPC skin? Download favorite skin (you can download a skin-pack in Skins for Minecraft PE category. Then rename the downloaded skin to farmer.png and copy it here: /games/com.mojang/resource_packs/Custom/textures/entity/villager. How to install the Custom NPC mod?